Phyconet provided a great opportunity for the whole team to uncover how the world of microalgae and biotechnology is progressing. In addition to this it provided I-Phyc lab tech Jeremy Winter and Chief scientist Dr. Lucie Novoveska with a platform to exhibit some of the teams latest work. I-PHYC have had a very busy year preparing their industry scale algal wastewater treatment plant. Jeremy was happy to present a poster showcasing the teams progress as well as providing more information on the large scale process and future goals. Jeremy was happy to chat with fellow conference delegates and answer any questions. 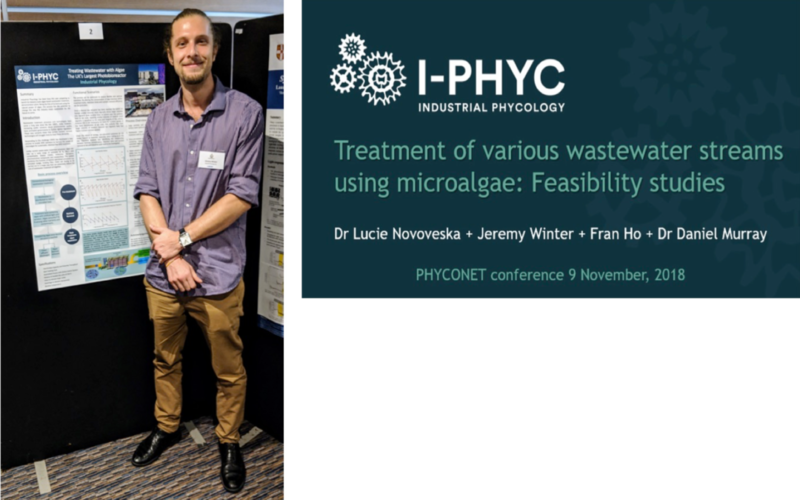 I-PHYC have not only been focussing on their demonstration plant, but have been investigating the feasibility of using microalgae to treat various wastewater streams. This time, Lucie took to the stand to discuss the teams findings in microalgae wastewater treatment from various industries ranging from tin mine effluent to dairy washdown!